Nordisk Company produces outdoor gear. It doesn’t sound like the most glamorous in the world, but it’s not the intention either. Now the Silkeborg-based company will, however, start a more luxurious, glamorous, version of camping, called “glamping”. A holiday for modern people, who need a peaceful place from the outside world, have lived in the world’s most fancy hotels and would like to try something new. That is why, Nordisk Company and the furniture manufacturer Kvist Industries participated in the “Talent Program 2017” together with their team of students with their idea for an outdoor furniture series inspired by both Japanese culture and aesthetics and the Nordic design tradition. The competition matches an established company in the furniture and interior industry with a team of design students from design schools and programs in Denmark. The students are asked a task by the company, which they must try to solve. The team that, within the frameworks of the companies, has solved the task best, is victorious. We can reveal that it was no easy choice for the jury. Nordisk Company and KVIST Industries were a team, and the team of students had the job of creating an outdoor furniture series that was both aesthetically beautiful, well-made and not least practical. The students, Team Nordisk+Kvist, had designed and prepared a furniture series based on both Nordic design traditions and Japanese aesthetics intended for Nordisk Company’s growing outdoor market. “We are very pleased with the result of the students’ work, which we also want to go on with. We must have some meetings to determine how the products must be optimized before final production. The students’ approach to the design process has been really fresh. They are very aesthetically based, as they are not quite used to thinking in practicalities and economics, which is only a positive thing. However, it has been a challenge for the students to work with two companies on the same task, but a necessity as Nordisk Company does not produce furniture itself”, says Vibeke Heegaard Pedersen from Nordisk Company. The students were also happy with the opportunities provided by the Talent Program. “For us, it has been great to work with a real company. It clearly gives you a certainmotivation when working with someone who actually has both the possibilities and intentions to put our idea and product into production if it is suitable for it”, says Jakob Bladt Jensen, who is a student at DSKD and was part of team Nordisk+Kvist. At Nordisk Company they still work with the students in order to put their design into production. Just getting a physical product on the CV is a great opportunity for the students, says Nikolaj Bo Nielsen, who is a student at VIA Design and also a part of the team Nordisk+KVIST. The reason for the satisfaction of the product’s design is, according to Vibeke Heegaard Pedersen, that there has been good communication. “They have been really good at asking us for both challenges, functionality and getting inspiration. We are very pleased with the aesthetic result and the product collection itself, but on the constructional part there are still some challenges to solve before we are able to put the series into production, she says. The winner receives 16,000 DKK for sharing from Lifestyle & Design Cluster, while a gift card of 4000 DKK is awarded for “Best visualization and presentation”. Of course, with both prizes, a diploma follows. 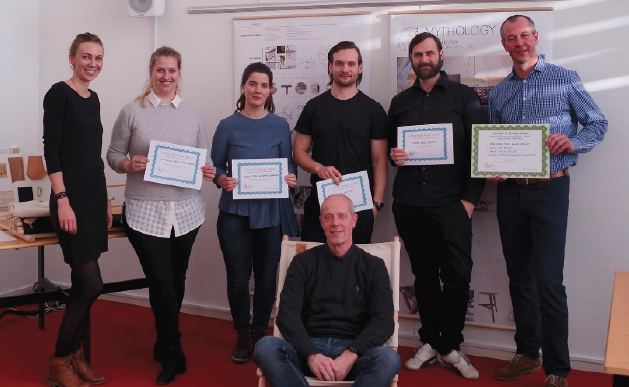 The prize for “Best visualization and presentation” went to Team Nordisk+Kvist, who with their Nordic / Japanese aesthetic outdoor furniture series impressed the judges. The judges found their thoughts, ideas and solutions both visually satisfactory and very ambitious. The main prize went to the competitor from team KVIK, who among other things received praise from the jury for having made a product that was relatively easy and not least quickly realizable. At Lifestyle & Design Cluster we congratulate both teams for their great work!